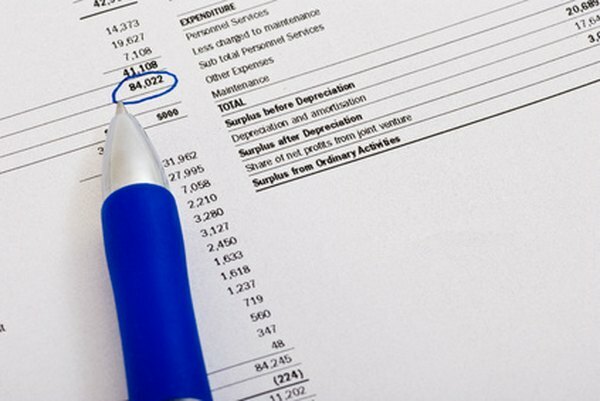 Financial statements are part of quarterly and annual reports. Financial statements include the income statement, balance sheet and statement of cash flow. They contain current and prior-period results, as well as supplementary notes and management's analysis of current and future business conditions. The statements are useful for analyzing trends and comparing different companies in the same industry. Stock prices reflect the financial fundamentals over time. The balance sheet summarizes a company's assets, liabilities and shareholders' equity, which is the difference between assets and liabilities. Determine if short-term liquid assets, such as cash and accounts receivables, are sufficient to cover current liabilities, such as bills payable and short-term loans. Analyze a company's level of debt with respect to its assets and equity. Companies with high debt levels lose operational flexibility. For example, rising interest rates could lead to higher expenses, which would drive down profits and stock prices. Similarly, falling revenues during an economic recession could lead to cash flow problems and possible default on debt payments. The two key lines on an income statement are the top and bottom lines. The top line is the revenue and the bottom line is the net income. You subtract cost of goods sold, administrative, marketing and other expenses from revenue to calculate net income. Successful companies are able to maintain or grow their top and bottom lines. The stock markets pay particular attention to earnings per share, which is the ratio of net income, after subtracting preferred dividends, to the number of outstanding common shares. A stock's price-to-earnings ratio is useful for determining entry and exit prices. The PE ratio is the ratio of the stock price to the trailing 12-month EPS. A possible entry point for a stock is when its PE ratio is at or below the industry or market average. Some companies distribute part of their profits as dividends to shareholders. The stocks of these companies are attractive investments because investors receive regular income and participate in capital gains. The statement of cash flows summarizes the cash inflows and outflows from various activities. Consistent cash flows provide strategic and operational flexibility. Companies could make plans to enter new markets, build new facilities and invest in research and marketing. Disregard the cash flow effects of one-time events, such as issuing new shares or building new facilities. Read the section titled "management discussion and analysis" in quarterly and annual reports because it contains detailed explanation of the recent results and expectations for the future. Review the reasons cited for changes in quarterly and annual results. For example, a company's revenues might fall short of expectations because some of its customers have delayed placing orders. This would not necessarily be a cause for concern. However, if the company is about to lose a major customer to a competitor, that could mean declining revenues and profits for the near future. Publicly traded companies usually webcast their conference calls to discuss quarterly results. Some companies archive the recent webcasts on the investor relations sections of their websites. Listen to these calls, especially the question-and-answer session with analysts, for additional insight into the financial statements.